Ring News 24Boxing News Breaking Boxing NewsIs Jarrell ‘Big Baby’ Miller a Real Player In the Heavyweight Division? 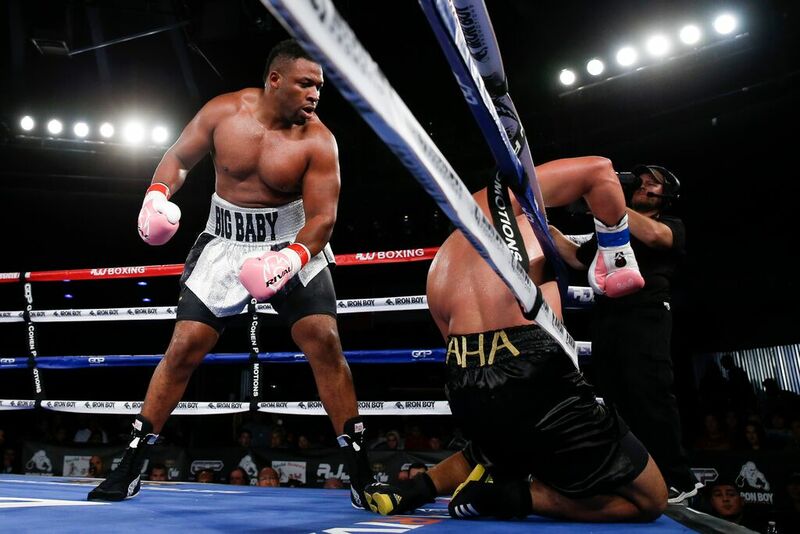 Is Jarrell ‘Big Baby’ Miller a Real Player In the Heavyweight Division? This weekend on HBO, from the Barclays Center in Brooklyn, New York, undefeated heavyweight contender Jarrell “Big Baby” Miller advanced his career forward with a clear victory over veteran gatekeeper Johann Duhaupas over 12 rounds to take a unanimous decision on official scores of 119-109, 119-109, and 117-111. Miller relatively controlled the fight at ease and at his pace. On the outside he pot-shotted and landed enough to get his respect, while he also dominated on the inside, using all of his 304 pounds to bully his older foe around. Still, despite dominating, Miller wasn’t able to secure a knockout that he might have preferred. Miller landed 261 out of 782 of his punches (33.4%) while Duhapuas was 128 out of 538 (23.8%) during the bout. With the win, Miller moves to 21-0-1 (18 KO’s) and, at just 29 years old and ranked highly, at #3 in the IBF and the WBA, it is only natural for him to keep pushing for a fight with IBF/WBA/WBO champion Anthony Joshua. Given the landscape of the heavyweight division at the moment, it’s not unrealistic to rule this contest out. Eddie Hearn of Matchroom Boxing, who promotes Joshua, had mentioned Miller as a possible opponent for Joshua’s eventual American debut. A fight in Brooklyn makes sense, as Miller is a native of Brooklyn, plus the fight would draw given how huge of an international star Joshua is at this point. In his post-fight interview with HBO’s Max Kellerman, Miller spoke of the Joshua fight. Miller posted the above clip of his interview to his Instagram, with the caption “Glory to God We Got the Win”. But what is next for Miller? Figures here that Hearn is likely comfortable letting Joshua sell out massive stadiums no matter who he fights, so why rush to bring him overseas for a fight not everyone is interested to see at the moment. The reality is that Joshua’s most interesting fight at this point is a potential matchup with WBC heavyweight champion Deontay Wilder, who is coming off of a barburner of a victory in stopping Cuba’s Luis Ortiz in the 10th round last month. That fight also took place in Brooklyn. So where does Miller stand? Perhaps he needs a bit more seasoning before going for the belts. Fights vs. guys like Dillian Whyte or former champion Alexander Povetkin would be nice steps in the right direction for Miller. He definitely has the charisma to sell any fight, as well as the size and frame, but there seems to be moments where he gets into lulls of action at times. And it’s evident that Miller has power, having stopped several opponents, yet he might not have enough to match the big hitters in the division. The rest of the year will tell us a lot about Miller.